MY LIFE by Silke Ledlow: SUPER EXCITING ANNOUNCEMENT!!!! Remember I was telling you a few weeks ago that we are moving...well we are not!!! The housing market is very, very slow and we had not even one viewer since we had the house officially on the market....bummer!!! Since we can't sell our house and can't afford two households we figured we are staying in Georgia. God had other plans and for what ever reason our move to Texas was not meant to be!!! To be honest...it's fine with me, because now I can continue stampin' without any interruptions....wahooo!!! 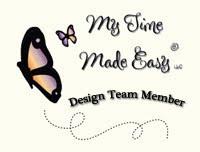 Here is where the exciting news comes in....the fabulous and super talented Lauren Meader asked me to join her amazing My Time Made Easy Design Team !!! I'm beyond excited - somebody pinch me please!!! If you know me....I love creating gift sets and this opportunity is a dream come true for me with Lauren's fabulous templates and stamp sets!!! Here are two projects I have done a few days ago with Lauren's Slip Cover template - Shaker Gift Set and Silhouette Gift Set. If you are not familiar with the MTME Design Team....here is a link to all the fabulous ladies!!! Lauren Meader (Owner/Designer), Catherine Doucette, Dawn Easton, Geny Cassady, Katie Cotton, Kristin Bueter, Lesa Rapp, Mona Pendleton, Pam Imholz, Stephanie Kraft and Tracey Cuccia. Please stop by Lauren's Blog and check out the rest of the announcements!!! The new MTME May Release is coming up and you don't want to miss it!!! Unfortunately I don't have my new goodies yet, but I will jump fully on board with the June Release!!! Congratulations Silke! I'm happy to hear that you aren't moving, and can continue blessing us with your beautiful inspirational creations! I'm headed to check out Lauren's site now! Congrats!!! Congrats on the Design Team!!! That is fabulous.....your work is some of the best out there and what great products you will get to show off your talent!! Congrats!!! happy you are staying. You will be blessed for trusting Him no matter what!! You are a great example!! Congrats on the new DT...they are blessed to have you! Congratulations, Silke! You will do Lauren proud! Well, of course you know that I am thrilled you aren't moving so I will have more chances to see your sweet, smiling face! And how great about being on Lauren's team - she does create fabulous templates. Looking forward to seeing what you do with them! YAYYYYYYYY! How fun for you-congrats on the team! I'm happy if you're happy staying put, and as you said, God has His way of working these things out. And hey, if you stay where you are a get together is DEFINITELY in our future, girl! Mercy and Pam and I are waiting!!! Congrats Silke on becoming a member of Lauren's DT! So glad we won't have to take a sabbatical with seeing your gorgeous creations - lol! Congrats on your new DT honor...I'm not familiar with Lauren's templates, so look forward to seeing what you create! Glad you don't have to deal with the hassle of a move :D All will occur when it's meant to be. Wow, that`s awesome news, Silke!! Congratulations! Can`t wait to see what you`ll create with those templates!! Fantastic news!!! On all fronts! Congrats on the new DT gig--you will rock the socks off of Lauren's templates--she couldn't have picked a better person to add to her team! You go, girl!!! Yeah on 2 counts!!! That you aren't moving and the MTME DT!! That is fabulous and can't wait to check out what you create. Congratulations Silke! I am sure you will work your beautiful magic with the MTME products :) All the best! Woo hoo!! Congrats Silke on the DT with the templates and on not moving! You must be thrilled! Wow, a big congratulations to you. Lauren's templates are such fun to do, love them. On the up side of not moving...you don't have to pack up all your stamping stuff you just keep on producing those beautiful cards. Hey girl! Congrats on making Lauren's team! That is fabulous. I can't wait to see your wonderful clean style adorn the templates she designs!! Sorry about the house, 3 houses on my block alone went up for sale and within months, pulled off the market for the same reason. NOTHING is moving. Sigh, seems a nationwide thing. Big congratulations hugs to you! Congratulations, Silke!!! WOW! You totally rock, girl! Congratulations!! Can't wait to see your creations (always amazing) as a DT! Wow! Congrats, Silke!!! With your fabulous style, you will be a huge asset to her team. Obviously I should have read this post first - I happy that things have worked out the way you wanted them too and you don't have to pack up and move across the country!! Secondly.....CONGRATULATIONS!!!!!!! WOOHOO - you are going to ROCK at MTME!!!!! Congrats on your new appointment, Silke! You'll do beautiful work for Lauren and I'll be looking forward to seeing more of your wonderful gift sets! I'm sorry things didn't work out for your move but, as you say, it just wasn't meant to be. Enjoy your new goodies from Lauren! Whohoo.. Congrats girl! That is awesome.